In this episode of Swedenborg and Life, viewers witness a panel of authors, writers, and general life experts talk about the best ways to be a good person in everyday life. Their insights and stories are a great way to invest some time in thinking about the application of lofty spiritual ideas. This group talks about issues from organized religion to deeply rooted ideas and assumptions we all make about God. They are an inspiring bunch. This recap can only cover a bit of their expertise, so be sure to watch some snippets to get a rounder idea of the conversations involved. Our host Curtis Childs leads viewers through this lively and inspiring discussion. Our guest speakers bring many different ideas and perspectives to the discussion. Soni talks about her experiences working with students—until they start putting ideas into action or into their own words, they will simply memorize facts and quickly forget them. Combining facts with action makes them more real and memorable. Peter notes that truth by itself has no substance, but it is given substance when we apply truths to life. We know truth is real when acting on an idea will bring about good. Chelsea discusses the value found in spiritual texts—for example, the value in the Bible comes from bringing life to the text. As soon as it resonates with life, you can take away ideas, apply them, and use them to improve your life. It starts with reading and looking at ideas and taking away the ones that resonate personally. Curtis talks about using truth to navigate the “flora and fauna in the mind,” as we all have to look for the writings and ideas that come alive for us in good ways. He notes that truth is only true when it is applied to something good—if you apply a great idea to some horrible emotion or impulse, the great idea isn’t great anymore. In the end, all the panelists focus on the idea that truth can only exist alongside good. It can’t be isolated or removed from action, because action brings it to life. Ideas inspire us in the moment to act in good and loving ways. In the present, each individual’s ego doesn’t exist—ego only exists when it can “design the future and color the past,” as Curtis says. Soni notes that the only thing we can control is our attitude in every passing moment. We can prepare ourselves and learn in order to make better choices and actions. But it doesn’t matter how many good ideas we have if we only use them to hurt people; ideas must be used in good ways to be true. This question talks about the ways we express love for people without getting too attached to the things that aren’t spiritually real. 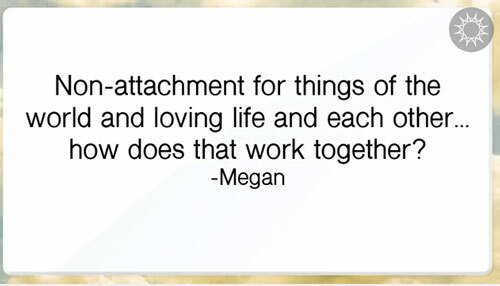 The concept of non-attachment to the world can become misleading, because being connected to other people is not a bad thing. Chelsea points out that life is a balance between control and giving up control. This question leads into the idea of providence: trusting in God’s providence to take you places and give up control of the things of the world. Priority should be love of the Lord and the neighbor. Attachment would be putting objects and things above people. Peter talks about making a decision about whether to stop kids from playing in his yard. They might mess up his yard, but he found that it was important to let them play because the yard was just an object, and the kids had to be more important. Objects are useful in their service of loving the neighbor and the Lord. Soni talks about the fight between giving up control and arranging and controlling people’s lives, especially when we believe we are in a position to give them great advice. She says that she has a psychological tool for stopping herself from trying to interfere in situations where she knows she shouldn’t: picture other people’s lives as a movie where you can observe but you know that you’re not the director. Peter says that there is arrogance to the idea that we know what is best for other people. And Curtis adds that it is important to remember that other people belong to the Lord. People don’t exist as an adjunct to us—they exist because they have a unique connection with the Lord. The Lord is the closest to every person. We can always reflect on our place in the lives of others and keep these things in mind. Chelsea talks about the usefulness in realizing that everybody is going through a flow of different states. Even when people find themselves in bad places, it is only a part of the puzzle. Condemnation will not help, but surrendering the bad things you encounter inside yourself will help you get closer to the Lord and better understand yourself. Curtis talks about overcoming negative emotions by putting yourself in someone else’s position. If we know how someone else is doing or understand that their life is as complicated as our own, it helps put negative feelings in perspective and allows us to use those negative feelings to overcome impulses that would lead us away from good things. Soni talks about her mantra for happiness: “My happiness is not dependent on other people.” This mantra helps shift her focus to better ways to grow and develop into what she hopes to be. Curtis notes the way that hell loves to condemn evil, while heaven focuses on the good and tries to put a good interpretation on the bad things—both perspectives contain a little selective memory. Curtis says, “The more I find what I believe to actually be God, the more there is this fluidity and accommodation.” Chelsea applies this idea to the way we can be understanding, loving, and supportive to ourselves; and we can be kind to ourselves through our changing states and perspectives. Peter and Curtis both talk about the importance of seeing the humanity in others—it helps us treat others with kindness and respect, even if we’re upset. It helps us give people the benefit of the doubt, much like heaven looks at the evil choices made by others. This question comes down to one major idea: the idea that you must love wisely. Treating others and yourself with kindness and respect goes a long way. Curtis kicks off the discussion with a short quote from Swedenborg: “We continually pray when we live a life of kindness, if not with our mouths yet with our hearts” (Apocalypse Explained §325:12). Peter notes that worship is defined in a couple different ways, but real worship is living a life of love. If you’re coming from love, then that’s the highest worship you can have. 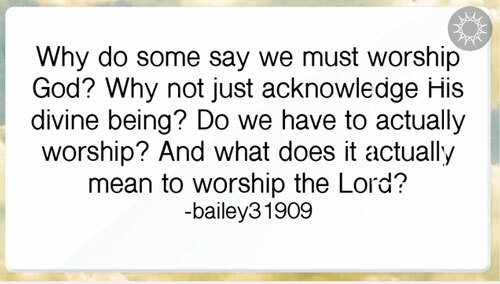 It’s all about the focus of the worship—if the focus is on building good spiritual habits that lead you toward loving and learning more, then worship will help you reach the Lord. Soni talks about a four-step process toward putting the Lord’s will into practice: compel, habit, confidence, and delight. These steps focus on ways to make yourself form spiritual habits that eventually bring a sense of delight and happiness. Curtis discusses the idea that the good we have is not intrinsically ours—we can feel good or bad, depending on the day, and mostly it’s not even about us. Chelsea says that good feelings help lead us toward a good spiritual life—you get into the practice of worship and then spiritual life comes into it. Peter notes that finding living truth is the goal of worship. Living truth comes to life and creates good that leads and guides you. Curtis says that doctrine is a starting point, and then you put it into life. To me, God is living. He’s a verb. We continually want to turn him into a noun. We want to understand him, control him, do the right practice, cross him off. Now we’ve got that handled. But he’s always living and he’s always moving. . . . No, you aren’t going to be able to understand and thereby control. You don’t understand. It’s going to be a living relationship. . . . Stop trying to figure him out. . . . It’s very humble and very fluid and it’s changing all the time. I truly don’t understand it, but I don’t have to understand. . . . I think we make it much more complex than God is asking us to make it. Peter starts this section off by telling a story about his wife. He had a beautiful moment of realization when his wife was on the phone instead of getting ready to go on a bike ride with him: “I held this idea that other people should make me happy. . . . That is total insanity.” This realization freed him from feeling upset that she wasn’t ready to go on the bike ride. 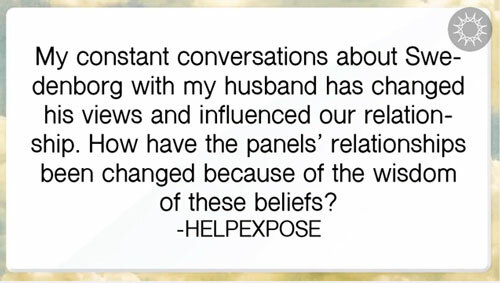 His realization about the truth in the situation gave him the freedom to feel happy for his wife and happy that she got to do something that was making her happy. Something simple can shift us and set us free—that’s what the truth is made to do. Truths give us tools to break free from unhappiness and hurt. Curtis notes that romantic relationships always seem to follow different rules than other relationships. Romantic relationships are “supposed to be” fun and light and filled with banter. They don’t seem to follow the same rules about kindness and loving the neighbor. However, they do follow the same rules, because every relationship follows these rules about loving the neighbor and treating people well. But it’s hard to remember that relationships, as Chelsea points out, go through stages and shifts just like all people do. They go through different feelings and periods of connect and disconnect. Soni (whose new book on altruism is now available on Amazon.com) talks about this kindness and the influence of charity and loving the neighbor, taking an example from her teaching career. The feelings that stem from showing kindness improve life drastically. In the end, Curtis reminds us that at its core, everyday spirituality is all about the way that truths enrich life. The action involved in bringing truth to life in everyday spirituality brings good things and true things to the world around us, creating more pathways for God to reach us and guide us in our day-to-day life.